Imagine there is a bar, which serves a variety of food and drinks and makes you feel like you have been transferred to another world! The bar, which is called “Nobu”, is located in a back alley of the Old Capital. This is a small tale that revolves around this otherworldly bar. While adorable, I feel awkward reading it. Every chapter so far has been more or less summed up by: "Oh my! My German (ish) tastebuds just cannot handle how amazing and novel Japanese food is! Our food is rubbish by comparison!!!". I love Japanese food, but some days I just really want some kraut in a sandwich. So it's not for me. Maybe it's for you. First time writing a review here. But it had to be done. Yes the story is about a pub/bar in a fantasy setting, and that's pretty much it, but theres nothing like "and x and x was added and then... more>> mixing for x amount of time and with the fire at x temperature" and so and so, like a lot of cooking stories. Here the story is progressing nicely, the cooking is not really cooking is more about the food. And I'm really happy how it's more about how is the kingdom (or was it empire?) doing, while listening to the stories of the costumers who are fascinated by the otherworldly food, literally. 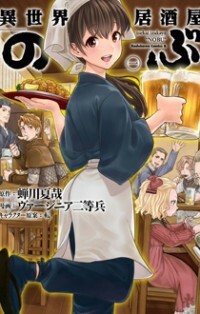 The store is connected to Japan while being in a fantasy world, so the food is good, cheap and novel, and the owner and waitress are like a mistery in many ways to the costumers. A beautiful slice of life masterpiece on the isekai genre. I can see from the character development the efforts the creator has poured in this work. A unique, refreshing and happy experience.